While many people may want to have nothing to do with Mr. Limbaugh, he is certainly a force to be aware of. He helps mold the news and sometimes make the news. Limbaugh, like all of us, might want to become more aware of himself as well. The chart presented shows his natal planets on the inner circle and the transiting ones at the time of his recent chest pain and hospitalization. • His Midheaven is in Scorpio which points out his penetrating, probing, twisting and “life-and-death” crusade with the public - certainly on his own terms. The Eagle being another incarnation of Scorpio may help explain his efforts to lead his American brothers and dittoheads. • His Horizon is at 0 degrees of Aquarius-Leo. That makes the writer want to question if he is really an Aquarian by Ascendant. Birth four minutes earlier would have given him a Capricorn Ascendant. Could he really be a Zero? It may be more generous to consider him having a Capricorn-Aquarius Ascendant giving him the opportunities and obligations of both. Like many of us, Limbaugh is a host of contradictions and polarities, many of which he and you and I do not recognize. • Limbaugh has three major planets - Venus and Mars in AQUARIUS and Jupiter in PISCES - in the first house of self. This again suggests the potential for a divided self (two signs in the house of self). Expansive Jupiter in that house may help explain his big body (300 pounds at one point) and his equally big ego. 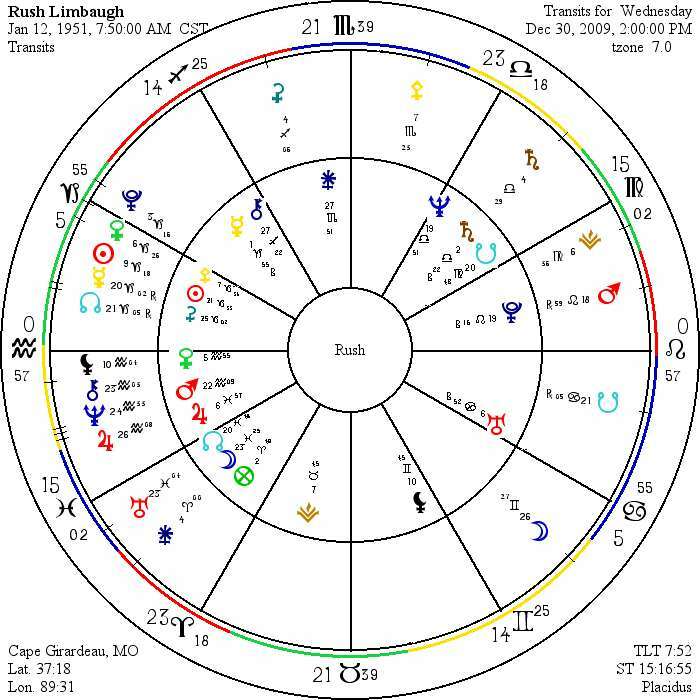 • At the same time, Limbaugh’s Sun is in the 12th house. A perfect place for a radio commentator. He can hide out there while he broadcasts to the world. • Limbaugh’s Moon is conjunct his North Node in Pisces in the second house of personal resources. His mental-emotional (Moon) nature is certainly Water controlled. Drugs and alcohol are natural challenges for him. His penchant for telling people to make their own way is explained while he is fulfilling his destiny to make his own via the second house placements. • I almost forgot. Limbaugh has four retrograde planets. For him, retrograde might be another name for conservative, or ultra-conservative. Reactionary might be another fitting label to put retrograde into political terms. • One more thing, to top it off. Note that Mr. Limbaugh has the sign of the terrorist - Juno - very close to his Midheaven. That cigar can have lots of uses. As in the outer world, there is a lot going on in Limbaugh’s life as suggested in his personal transits - leading to chest pains and hospitalization just before the New Year. • Transiting Mars is conjunct Pluto in Leo in the 7th. 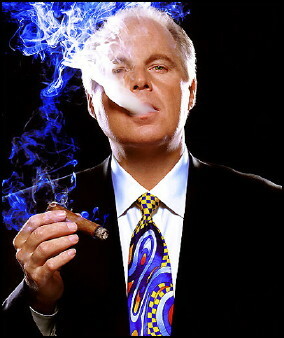 Limbaugh is a man of bombast and high energy and excess. But, these two passing together add extra stress. They can be energizing sometimes, explosive at other. Remember, Leo rules the heart. 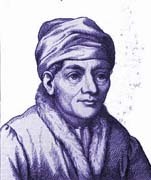 • The two oppose his natal Mars in the first. Dueling swords maybe. While battling in the name of truth, justice and the American way, Limbaugh is fighting himself especially in recent moments. • He has Jupiter, Neptune and Chiron along with the Black Moon transiting his first house of self. Further stress just over his shoulder. The first three - to the author’s view - are implicated in the swine flu epidemic which has manifestations much wider and subtler than straightforward flu symptoms. • Rebellious, irregular Uranus has been transiting his North Node in the 2nd house. • Finally, Saturn is transiting his natal Saturn in the 8th house. His second Saturn Return. Quite likely, Limbaugh thought he was going to die with all these energies beaming in on his large but finite frame and persona. Saturn Returns are big deals. Affecting his 8th house makes for a potentially lfe changing moment. Rush Limbaugh is just a mortal, whatever he may imagine or try to tell us. You and I can be a little more than mortal by forgiving his rational and irrational exuberance, human errs, and intolerances. He is experiencing a focus of energies through Mars passing over natal Pluto in Leo with transiting planets opposing which should have some impact on his heart center. In any case, he made his way to medical care. Their tests did not discover any solid, tangible, measurable changes in his body. Nothing had crystallized into organic disease. Fortunate for him. Medicine does not do well with discovering and explaining functional problems. Which most of our ailments amount to. Nothing was “wrong” except on an energetic level. But, it wasn’t wrong in any case. Energy was meeting energy which we humans really are. That is what astrology is all about. Medical astrology is just another angle on the same theme, for Rush Limbaugh and the rest of us humans.